Finding a builder for your new log home or log cabin can be an overwhelming task and is one of the most important decisions when building your log home. There are a few things you can do before you hire a builder to make your home building project go as smoothly as possible. Experience - Log home construction is slightly different than the traditional stick built construction. Typically, it is better to choose a builder who has had previous log home construction experience. Although log home experience may be preferred, a good reputable builder who is experienced in the construction industry and has a good history with his past customers, can do equally as well on your log home investment. References - Get a least 3 references and ask to see the builder's work on their recent projects. You want to see the builder's craftsmanship up close if at all possible. Do your due diligence. Estimates - Ideally you want to get 2-3 estimates. An estimate that seems too good to be true probably is...you get what you pay for. Rapport - Communication is key when deciding on a builder. Do they listen to your thoughts? Are they responsive and available for questions? Someone that you can never get in contact with may not be the right fit for your project. Sometimes you may not be able to be on site during construction and it is important you feel that you have a builder that can achieve positive results. Contract - You want to look over your contract carefully and see what each builder is providing. 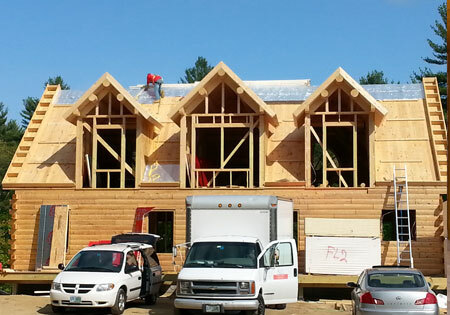 While one builder may do the interior framing of your log home, another may not. Also we find that some builders do not have the labor of caulking and staining the home in their contract, this is sometimes extra. You want to be sure what is included and what is NOT included. Updates - Many log home owners are not located where they are building their dream log home. It is important that there is a line of communication for updates on your project. Speak with the builder weekly about how the progress is going . You could even have it set up for the builder to send pictures of the work progression or even videos. You put a lot of time in researching the home you want to build. You should also invest the time in finding a builder to assure your log home investment is built correctly. You can most certainly do that. With a full set of plans you get a construction manual that is geared to do-it-yourselfers. Why not just build it yourself?